A mild form of Drysol in a solution of Aluminum Chloride in Anhydrous Ethyl Alcohol. Due to its lower concentration, it is especially suited for the face, back, and toes and is also excellent in maintenance therapy. No prescription is required for this product in Canada! The active ingredient in Drysol is aluminum chloride hexahydrate. Over 1% of the world population suffers from hyperhidrosis. 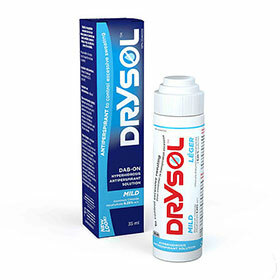 If you have tried several different kinds of over-the-counter antiperspirants without success, Drysol is your solution. Drysol is a prescription strength medication in USA which is commonly prescribed for excessive sweating. A fairly common problem, excessive sweating can be limited to the armpits, but often affects the palms and soles of the feet as well.